FiveThirtyEight projects them for nine wins, but the Hawks should be good for at least 10. They should sweep the 49ers and Cardinals, which would give them six wins. And they should be able to win four of the seven other games because: (1) They have the makings of their best offense under Pete Carroll; (2) the offense faces the third-easiest schedule the rest of the way; (3) K.J. 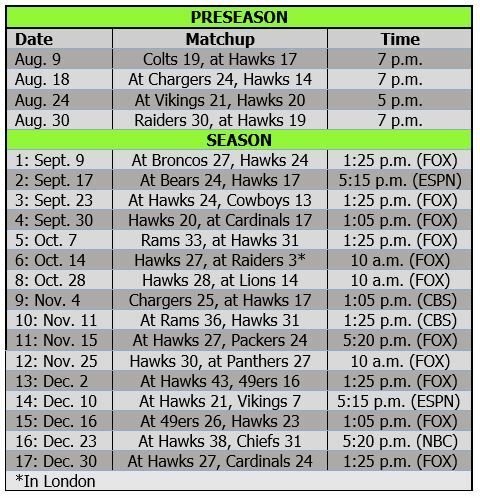 Wright and Ed Dickson are about to make their season debuts; and (4) the Hawks have a home-friendly schedule (five of final seven). DVOA: 30. Offense: 20. Defense: 30. Early preview: The Lions are 2-1 at home, with big wins over New England and Green Bay, and are averaging 27 points the past four weeks. 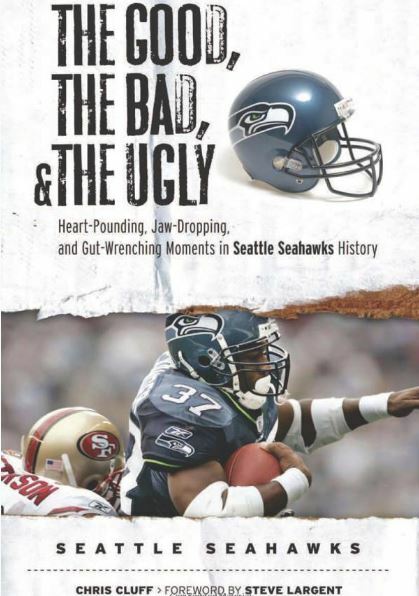 But none of the defenses they have faced are as good as the fourth-ranked Seahawks (per Football Outsiders). The Lions also are giving up 146 rushing yards a game, which plays right into Seattle’s suddenly powerful blocking hands. And the Lions have one of the worst special teams and lost their top kick returner vs. the Packers in Week 5. DVOA: 5. Offense: 3. Defense: 12. Early preview: Philip Rivers always gives the Hawks trouble, and he has some great weapons this season — they are averaging 412 yards and 29.2 points per game. If the Hawks are going to have a chance, this one probably will be on Russell Wilson’s shoulders — because the Chargers are allowing under 97 rushing yards a game. DVOA: 2. Offense: 1. Defense: 17. Early preview: The Hawks played the Rams tough in the first meeting and also beat them in L.A. last season, but Seattle basically would need to play a perfect game — no coaching errors, turnovers, score-robbing penalties, etc. — to win this one. DVOA: 14. Offense: 6. Defense: 22. Early preview: The Packers will fly to Seattle for a Thursday meeting, which doesn’t bode well for them. Wilson’s Hawks are 6-1 on Thursdays, including a blowout home win over the Packers in the 2014 opener. Aaron Rodgers is always dangerous — as he has proved with a couple of late rallies this season. But the Packers have given up 61 points the past two weeks and are vulnerable on the ground. DVOA: 11. Offense: 12. Defense: 21. Early preview: The Hawks will be well rested for this trip, coming off the home Thursday game; but Carroll’s Hawks are just 3-3 in these games, so no edge there. However, the Hawks are 3-0 at Carolina in the regular season (we’ll forget about the playoff debacle in the 2015 season), so they know how to win there. This is a 10 a.m. start, but the Hawks are 2-0 in those at Carolina (again, not counting that playoff loss). One thing we do know: It probably will be a close game; all three of Seattle’s wins in Charlotte were by four or five points. DVOA: 27. Offense: 24. Defense: 25. Early preview: The 49ers are not the team they were supposed to be, with Jimmy Garoppolo and top RB Jerick McKinnon out for the year and receivers banged up. But C.J. Beathard has been a gamer, nearly leading the Niners to upsets of the Chargers and Packers. The Seahawks have won nine straight in the series, but they know better than to overlook this club — the last three wins have been by a combined 16 points. This is supposed to be a Sunday night game, featuring Richard Sherman against his old team; but, if the Niners stay on this slide, it likely will be flexed back to the afternoon. DVOA: 21. Offense: 16. Defense: 20. Early preview: The Vikings had a rough start, 1-2-1 including a head-scratching blowout home loss to Buffalo. But they have won two in a row and their respected defense — which has lost Everson Griffen and Mike Hughes — might be coming around. The running game had been nonexistent without injured Dalvin Cook, until Latavius Murray busted out with 155 yards against Arizona’s porous run defense. This is still a pass-first offense behind Kirk Cousins, though. The Vikings have six pretty tough games coming up, so their quality will be determined by the time they face the Hawks on “Monday Night Football” in Seattle. But it is unlikely to be good enough to beat Carroll’s club in prime time. DVOA: 1. Offense: 2. Defense: 28. Early preview: Patrick Mahomes is the fourth QB in NFL history to average over 300 yards and three TDs in the first six games, and the Chiefs are right there with the Rams as the top offenses in the league. Their defense, however, is another story. That unit has allowed the most passing yards (2,042) in the first six games of any NFL team since 1940. There’s a lot of football to be played before this Sunday night game, so we’ll see then whether the Chiefs are still a team of polar opposites. If they are, you have to like the Seahawks’ chances. DVOA: 31. Offense: 31. Defense: 10. Early preview: The Cardinals have scuffled along on offense, scoring under 20 points in every game except the 28-18 win over the 49ers. And they just bottomed out with a blowout loss against Denver — firing OC Mike McCoy afterward. 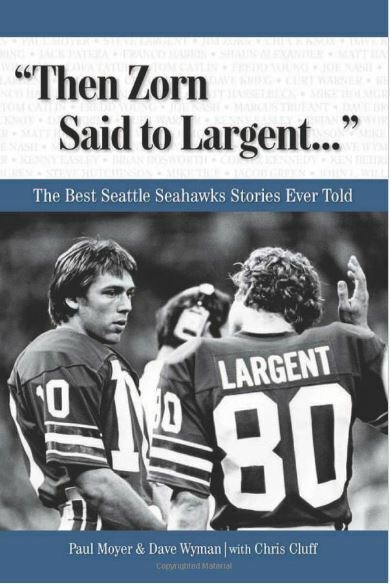 Even if Byron Leftwich can get Josh Rosen and company playing better by the season finale, Seattle should end its three-game home losing streak against these guys. Previous PostBye week status reportNext PostWill Hawks acquire pass rusher this week? So, 11 wins by running the table for the last 7 games. Could happen — the best PC teams are exceptionally strong finishers. I have the ‘Hawks at 9 or 10, mainly because the defense is relatively inexperienced and they have a lot of tough games ahead of them. Even so, the ground game necessary to keep the defense off the field appears to be there, which might be enough to get them to 11. What is the author smoking? More like 7 wins. Yep, seven wins the rest of the way, 10 total.